This mid-length moto glove from Torc features superior aniline goat leather construction and soft yet durable polyester interior lining. The contrasting leather straps and palm trim create a unique aesthetic sure to stand out amongst the hordes of plain ol' black leather gloves. Internal alloy polymer knuckle duster adds another layer of protection without compromising this gloves' unique look. Waxed finish looks great right out of the box! 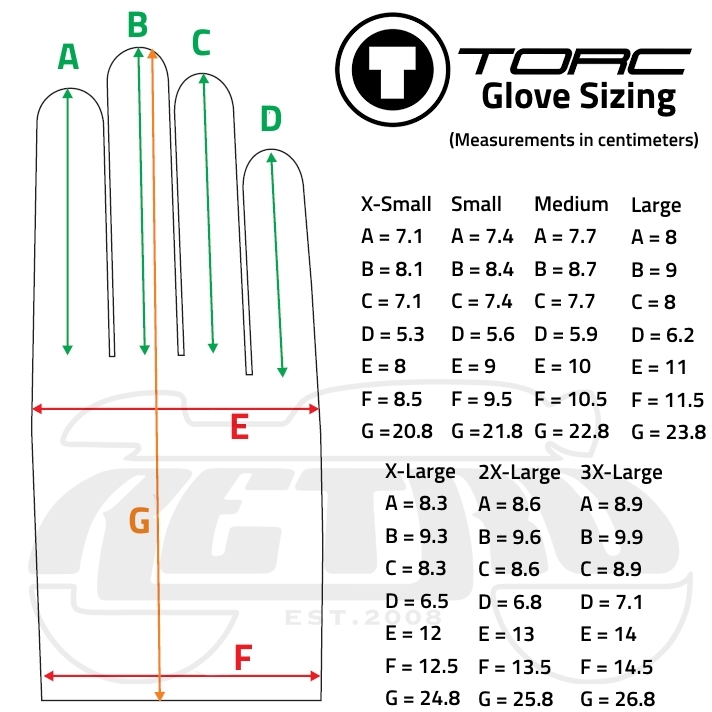 I have bought 3 other pairs of Torc gloves and they are all 2xl size. I normally wear a xl in work gloves but I find in Torc gloves I need to size up. My palm is 4 inches across. These gloves being out stitched are sewed and trimmed neatly. The interior is smooth and they are easy to slip on but the velcro adjustment if set to tight can cause the thumb seam on the outside of the thumb base to dig in so be careful in this. The color is a nice retro distressed gold / tan. The leather being a goat leather feels somewhat thin but its a tough leather and nice and flexible. These are a good summer weight glove. Gloves seem to be well made and fit according to their sizing chart. I love having the additional knuckle protection and extra leather on palms.- just a short time riding and they fit quite comfortable.